The beloved Carnegie Learning Centre is launching its new book Invisible Heroes: Aboriginal Stories from Vancouver’s DTES. This book is a collection of stories from our ‘Invisible Heroes’, a group of community-nominated aboriginal community members who are making daily positive contributions in many areas of neighbourhood life. The ‘Invisible Heroes’ group met for six months to explore storytelling and to reflect on personal journeys: their stories document the personal and the political. The book will be made available to learning centres across the country as curriculum material that reflects the experience of inner-city aboriginal community members. Join us in celebrating the launch of the book, and the courage and resilience of our ‘Invisible Heroes.’ Meet the authors, hear their stories, join in the discussion. 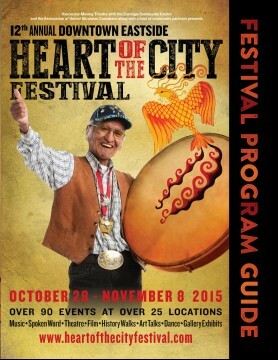 Stanley Paul, one of the Invisible Heroes, is featured on this year’s Festival program guide cover! 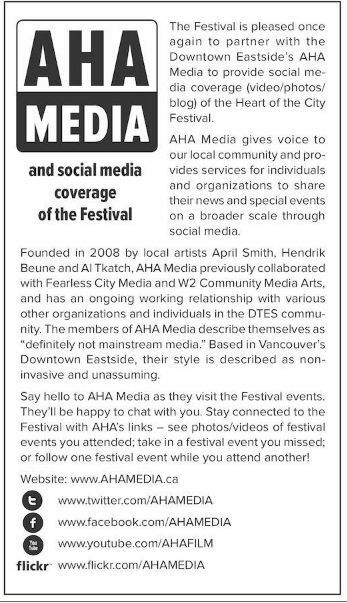 This event was on Day 2 of the 12 Days of the Heart of the City Festival. Please check the website for more events!